Kaspersky is yet another antivirus that has grown in popularity thanks to its protection capabilities, coverage, user-friendliness and of course, the cost factor. 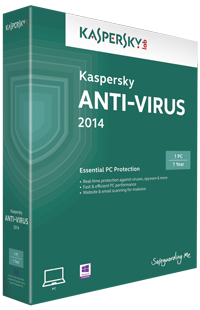 Various configurations of the Kaspersky antivirus provide varying degrees of protection for your Windows 8 systems from virus attacks, intrusion threats, Trojans, phishing sites and other malware. Updates are regular and automatic – their sizes are usually quite small and do not affect your broadband bill. Having Kaspersky Antivirus 2013 onboard will let you enjoy the www in its safest avatar: web without worry! AVG Antivirus packages have been around for years, and the latest offering is aimed at protecting your Windows 8 from virus attacks and other malware infestations. This customizable and flexible antivirus package is quite popular, and the reason is its proven effectiveness against almost all known threats to your system. Coming from a responsible provider, updates are constant and automatic. A great antivirus package to have around, especially if the web is your favorite haunt! Avast! has been around for ages – and it’s prowess in battling viruses and other threats is legendary. The Avast! Pro Antivirus 2013, with features such as “SafeZone” that secures your online transactions, and “Sandbox” that lets you surf the web from the sandbox-like protection of this antivirus, ensures that your Windows 8 operations are not affected by any hostile attack. the Avast! Pro Antivirus also has a remote access feature that lets you remotely customize your antivirus package. That’s protection plus convenience!